Just give it a little kelp meal and wait a month. June 3. "Casey at the Bat" was first published on this day in 1888 by the San Francisco Examiner. This is a poem worth memorizing; it races along on sporty little iambic feet. And now the pitcher holds the ball, and now he lets it go / And now the air is shattered by the force of Casey's blow. We all know how it ends. Host a recitation of it anyway, then decide which Crabs game to attend on Saturday. There's nothing more demoralizing to a gardener than having to buy one of those little bags of fresh herbs at the supermarket. Save yourself the humiliation and plant some basil. There is a Greek columnar basil that grows as densely as a little hedge; one variety is called 'Pesto Perpetuo' and claims to overwinter indoors, which means it might just survive a Humboldt County summer. June 6. Reconsider any decisions you made yesterday. The City of Eureka has bestowed upon us such enormous recycling and yard waste bins that they have become their own sort of landscaping feature. Accommodations must be made for them: perennials relocated, walkways expanded, concrete pads poured, A woman of average size cannot possibly wrestle them out to the curb. Some of us have given them semi-permanent status as garden ornaments; they stand as monuments to our surfeit. Others try to conceal them behind the same flimsy trellis or gate that hardly sufficed before. When that fails, one has to find some sort of man to wheel them around, but we find that this presents its own set of complications. June 10. A greenhouse would be a very handy thing to have right about now. Tomatoes will only just now tolerate outdoor living; they'd much prefer a conservatory, as would most of us. June 12 -- New Moon, 4:15 AM. It is shocking to realize that there is more than one 4:15 in a day. Sleep through it, there will be another one along in the afternoon. 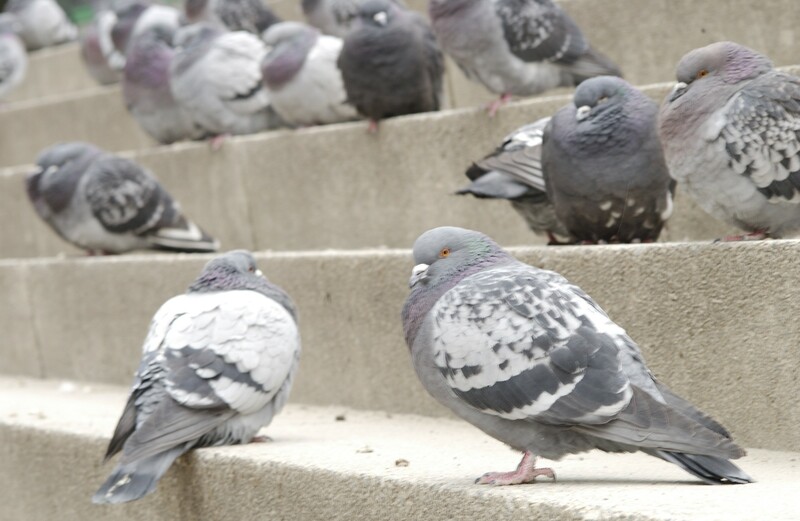 According to Wendell Levi, author of Making Pigeons Pay, breeders are often puzzled by what to do with their old birds. He offers several recipes, including creamed pigeon with celery on toast. It makes use of four old pigeons and will feed a foursome for bridge. June 15. Some people deadhead their rhododendrons. To save you the trouble of choosing, Curley's will make a half-order of sweet potato fries and a half-order of fried green beans and serve them as a single appetizer. Like most good things, this isn't on the menu: You have to know to ask. Now you do. Speaking of Curley, wouldn't it be swell if he opened a restaurant at the Eureka Inn? I will personally organize a parade in his honor if he does so, and write a catchy song to be performed by some DeMark or another on opening day. June 17. It was on this day in 1809 that the skull of Joseph Haydn was stolen from his freshly-dug grave for the purposes of a phrenological examination, the results of which confirmed that the "bump of music" was quite pronounced and that Haydn was, in fact, a composer of some proficiency. The skull went on to enjoy a century and a half of travel and adventure before being reunited with its body, which had long ago received a substitute head. Not wishing to further complicate the situation, Haydn's gravekeepers decided to allow both heads to be entombed with the composer. By common decree, Sunday is the agreed-upon night for band practice in the neighborhood surrounding Ross Park. June 18. Venus keeps reasonable hours today. She rises at 8:40 a.m. and sets at 11:21 p.m.
Lady Bird's plumage is almost fully restored. Thank you for asking. These days, an excessive amount of time is being devoted to fostering better relations between the parties. June 20. Father's Day. Get a haircut before you go see your father. That's all he really wants anyway. If you get a new kitten and your old cat hisses and spits at it, you simply cover the kitten with the oil from a can of tuna and lock the two of them in the bathroom for an hour. The older one can't help but lick the younger one; they'll be asleep in each other's arms by the end of it. We have not found this method to be as successful with chickens. June 21-- Summer solstice. This calls for some sort of drink with a flower in it. While it may be tempting to soak some roses in vodka and slam the whole mess down, a more civilized approach would be to drizzle St. Germain, a liqueur made of elderflowers, over a glass of chilled cava. Cava is the Spanish version of Champagne. As you sip it, mention casually that you used to drink cava all the time in Barcelona. Float a jasmine blossom on top for effect. June 26 -- Full Moon, 4:13 a.m. Here's a trick for falling back to sleep after a bright white orb suddenly illuminates your bedroom: Recall the moment you awoke the previous morning, and replay every detail of your morning routine in tedious detail. You'll be asleep before the coffee is made. The garden is madly, frustratingly in bloom all at once. Cut the flowers down; you've got to cut them or they won't keep blooming. The recipe for homemade flower food consists of a few drops of bleach and a splash of lemon-lime soda, but commercial rose growers swear by a pinch of ground-up Viagra in the water, which works according to more or less the same hydraulic principles in flowers as it does in men. June 30. There is no end to the weeding. Send for help.